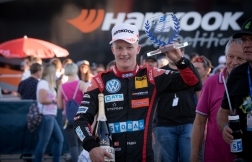 FIA F3 European Championship racer Fabio Scherer staged an impressive fightback to earn a pair of points finishes and his fourth Rookie class podium of the season at a rain-lashed Misano circuit in Italy this weekend. Having endured a difficult qualifying, the 19-year-old was in a determined mood on Sunday, charging from P18 on the grid to finish P10 in race two and going even better in race three to finish P8 overall, and P3 in the Rookie classification. 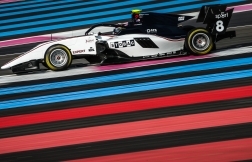 After setting an encouraging pace around the 4.226-kilometre circuit during Friday’s free practice sessions, the Swiss driver was disappointed to start race one from P16. Fabio had high hopes for second qualifying, which determined the grid for races two and three and was held in wet conditions, the kind of which he usually relishes. “We got a bad set of rain tyres with no grip, which meant we really struggled,” he explained. “There was also an issue with the race stewards awarding a grid place penalty to drivers who went over the track limits twice. On my quickest lap I was perfectly within the limits, but on a different lap I made a mistake and ran wide and was given a grid penalty. 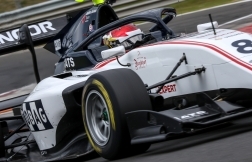 In race two, held on a circuit that was damp in places but dry in others, Fabio vaulted from P18 to P12 in just two laps, and continued his attack to finish P10 and earn a championship point. “My performance was spot-on. It was a good recovery, especially on a circuit where it is difficult to overtake,” he said. The first attempt to start race three was red-flagged due to heavy rain that made track conditions treacherous. When the race finally got underway, Fabio was in his element, confidently moving up to P14 in his Volkswagen-powered Dallara. Then, at a restart following a mid-race safety car period, he audaciously overtook six cars in one lap to move up to P8. “I made up a lot of positions at each restart, but then I had to defend like crazy because my car was actually quite slow,” Fabio explained. 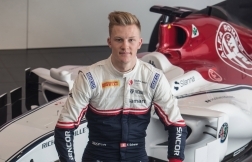 “Early in the race I sustained damage to the suspension and front wing, and that made it really difficult to drive. The front-left tyre was locking under braking and the front wing was moving around like hell, so getting from P18 to P8 was a really good job. “After qualifying and race one on Saturday I was feeling quite down, but what made things better was that the racing on Sunday was great fun – it was proper motorsport!” he said. Fabio’s FIA F3 European Championship campaign will resume on 8-9 September at the Nürburgring in Germany.